Mosquitoes are nuisance insects that bite and bother people. Where populated, mosquitoes may fly in to our eyes, ears, mouse and nose. 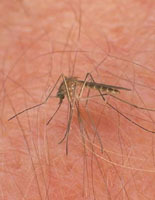 Some mosquitoes carry deadly disease such as West Nile Virus, dengue, yellow fever, and malaria. By learning about a stimuli that attract mosquitoes we may attract mosquitoes into traps or attract them to an environment away from ourselves. Stimuli can be anything that can cause a response or reaction. Possible stimuli for mosquitoes are certain sounds, odors, lights and colors. In this project you will test possible mosquito attracting stimuli such as color, heat and more. You will trap mosquitoes attracted by each stimuli and count and record the results.